Did you know that the amount of instruction time allocated to a discipline can help to raise students’ interest in a subject and that, as a consequence, their performance may also improve? Not only the quality of instruction but also the time available for learning can have a positive effect on students’ learning process, in particular, in the case of disadvantaged students. 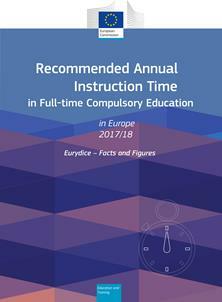 This Instruction Time report analyses the recommended minimum instruction time in full-time compulsory general education in 43 European education systems for the year 2017/18. Special attention is paid to reading, writing and literature, mathematics, natural sciences and social studies. The report outlines how reading, writing and literature are the subject areas that take up the largest share of instruction time, especially in primary education. Mathematics represents the second largest share of instruction time. Its share decreases at secondary level in favour of other subjects such as foreign languages. In addition to the comparative analysis, the report includes national diagrams that illustrate data by country and subject which have been collected jointly by the Eurydice and the NESLI networks.